Every Dividend Investor will tell you : collecting that passive income every month is pure bliss. This is money working for you instead of you working for money. I guess it sums up pretty well the whole idea of Dividend Investing : money working for you. I take comfort in knowing that my dividends all come from strong and reliable companies that will grow their money distribution over time for the benefit of their shareholders. As long as it beats the inflation rate, that should make me richer in 20-30 years. So, as you can see on my Dividends and Royalties page, January is below my average Dividend paying month of roughly 240 $. Last month I managed to collect 125,90$. (I'm not counting Nova Scotia Bank (BNS) yet, since I just recently bought it). Some of that money is in US dollars, which makes the payout even bigger since our loony is doing so badly nowadays. But again, there is withholding tax on foreign investment. So I guess it evens out. 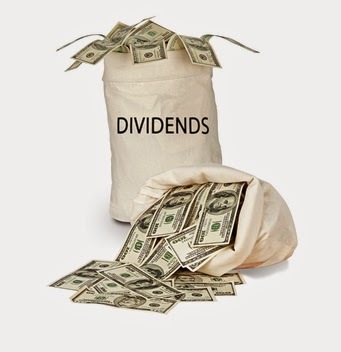 What do you think of my dividend income stream? I know it should be bigger, considering my portfolio, but I am still holding on to some cash. I'm waiting for a market correction. Will it come? Some serious dividends collected over the years. As for holding on to cash, there are arguments for either direction. I tend to stay fully invested with the cash assigned to each type of investment. This is of course above and beyond the cash I have in liquid savings, completely separate from my investment accounts. I have cash sitting my investment accounts and not doing much. it bugs me a little bit, but i wouldn't make much more interest nowadays within my saving accounts. I wouldn't mind investing that money sleeping if I could find some good entry points. I have initiated some new positions lately with VZ and BNS. But I don't want to have to follow to many companies... Thanks again for stopping. I will visit your blog.